Riverside is the fourth most populous county in California with over 2.4 million residents. Much of the region’s population growth took place during the Millennium Boom years when construction jobs and new home sales skyrocketed. But the recession left the region with deep losses in home sales volume, construction starts and employment. 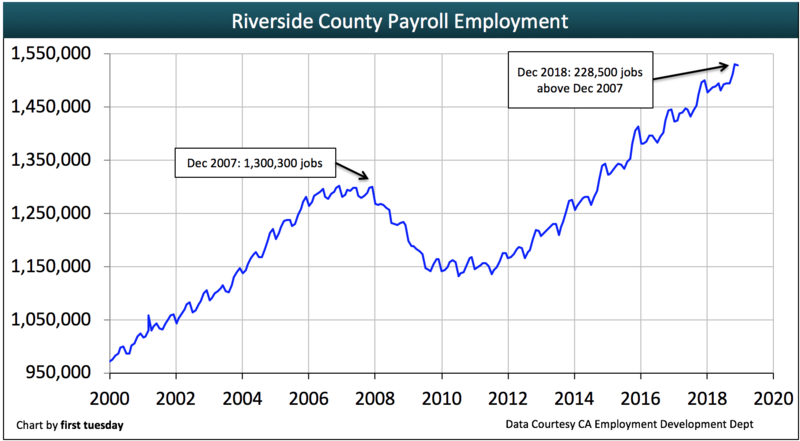 A decade after the end of the 2008-2009 recession, Riverside’s economy remains in a state of prolonged recovery, slowly gaining momentum as lost jobs are regained. Employment finally exceeded the number of jobs prior to the Great Recession at the end of 2014, though has yet to catch up with the intervening population gain between 2007 and today. Local sales agents can expect sales volume to slow and prices to decline in 2019, the lead-up to the next recession. 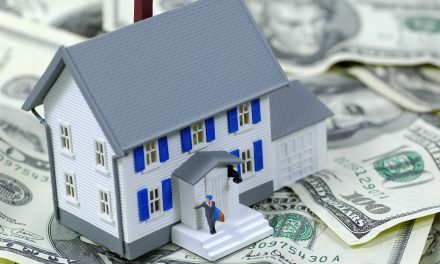 Still, the damage in 2019-2020 won’t be as hard-felt as during the Great Recession, which saw the housing industry’s collapse after the market was flooded with years of overbuilding and unqualified buyers. The next housing boom will begin to take shape after prices bottom around 2021. View the Riverside regional charts below for details on current activity and forecasts for its local housing market. Updated March 6, 2019. Original copy posted March 2013. 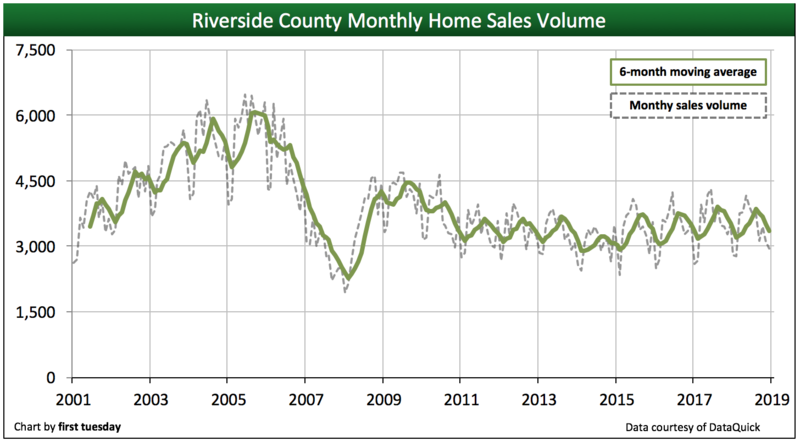 Home sales volume in Riverside County has remained mostly level in the years since 2011. The exception was 2014, when the area was hit particularly hard by the rapid exit of speculators, sales volume ending the year 9% below the prior year. Riverside recovered from that exodus in 2015, when sales numbers rebounded to 11% above 2014. Flash forward to 2018 and a true recovery still has not materialized, as annual sales volume continues to plod along, ending the year 3% below a year earlier. For some context, home sales volume fell quickly before and during the recession, then demonstrated a textbook example of an aborted checkmark recovery. Volume bounced back briefly in 2008-2009, initially due to what economists term a dead cat bounce recovery, which was extended another year by the home buying tax credit stimulus. Sales volume remained flat in Riverside until late-2013 when it began to trend down, bottoming in early 2015 and remaining roughly level since. Home sales volume won’t fully recover for a few more years, likely around 2021-2023, at which point first-time Generation Y (Gen Y) homebuyers and Baby Boomer (Boomer) retirees will converge to drive up sales volume and prices. In the meantime, expect reduced home sales volume and prices leading up the next economic recession, anticipated to arrive in 2020. Without homeowner or renter turnover, homes do not sell. 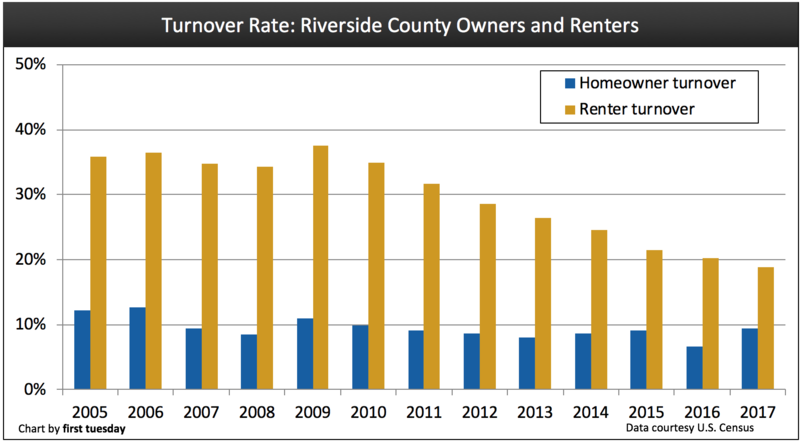 In Riverside, the number of homeowners and renters moving in recent years peaked in 2009 due to the tax stimulus and high level of foreclosures, which temporarily lifted sales volume as tenants became homeowners. In a reversal, turnover has swiftly declined since then as potential end users have chosen more often to remain where they are. The renter annual turnover rate fell from above 26% in 2013 to just below 19% in 2017 (the most recently reported Census year). On the other hand, the homeowner turnover rate rose significantly in 2017 to 9.5%, its highest level since 2009. Homeowner turnover is still below the level needed for a full recovery in home sales volume. As slow job growth and wages continue to stagnate, residents lack the confidence (and more importantly, often the financial ability) to move. The turnover rate will rise once employment catches up with population growth and wages improve sufficiently, as these increases boost confidence in the economy and reduce fears of carrying mortgage debt. Turnover rates are likely to slow across the state in 2019-2020, much like they did in the lead-up to the 2008 recession. Following this brief dip in economic activity, members of Gen Y will collectively rush from their apartments to buy and Baby Boomers will begin to retire in larger numbers, generally buying smaller, more convenient replacement homes after they sell. Immigrants will also play a significant role in boosting Riverside County’s suburban resale housing demand. Apartment vacancies will rise as they did in the early 1990s when the boomers took to buying homes. 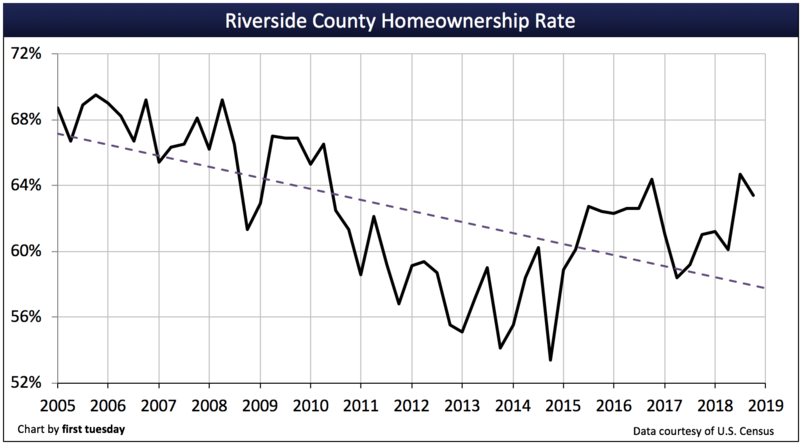 Riverside County’s homeownership rate fell steeply during the recession. Riverside’s rate of homeownership hovered around 68% from 2000 through the end of the Millennium Boom. As of Q4 2018, the homeownership rate appears to have risen fully from its bottom, now at 63.4%. Further, this is significantly higher than the state average, which is still 55% in Q4 2018. The return of significant numbers of buyer-occupants depends primarily on the creation of more jobs with better pay than the new jobs that have come on line as we go into expansion from this recovery. By the end of 2014, the jobs lost in the Great Recession of 2008 were finally recovered, several months following the statewide jobs recovery. But with the intervening eight years of population increase, the ultimate jobs recovery with the strong wage rises needed to support high sales volume and in turn price increases will wait until later in 2019, just in time for the economy to head into its next slump. The homeownership rate will remain below pre-recession levels until the years following the next recession, only to rise when members of Gen Y collectively gain enough income to become first-time homebuyers. 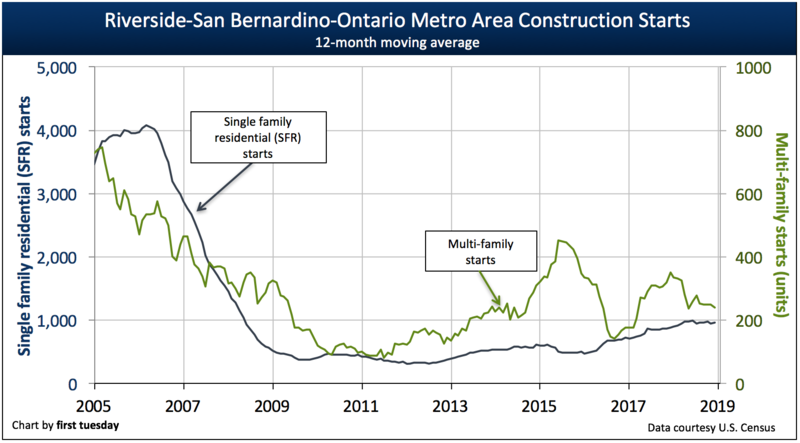 Residential construction starts are recovering marginally in the Riverside Metropolitan area. Single family residential (SFR) and multi-family construction both continued to improve in 2017, while multi-family starts fell back dramatically in 2018. Here, the focus on multi-family construction is far less pronounced than in regions closer to the coast, as the lower cost of land keeps SFRs within reach of more households. Construction increased dramatically during the Millennium Boom as the population moved from the urban centers of Los Angeles, Orange and San Diego Counties into the bedroom communities of Riverside County. Builders kept pace with buyer demand for new housing. Eventually, their starts overran the 2006-2007 decline in buyer demand. The excess starts resulted almost exclusively from distortions in mortgage and construction financing with personal guarantee arrangements. When the housing bubble burst in 2006, the sale and thus the construction of SFRs and multi-family housing plummeted. Small builders went bust in droves. 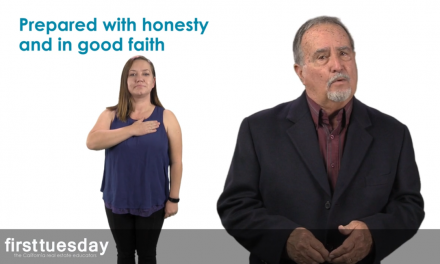 Today, the general trend for SFR starts in Riverside County is displaying signs of stability with no signs of reaching 2004 and 2005 numbers in the foreseeable future. The next peak in SFR construction starts will likely occur in 2021-2023 due to legislative efforts to increase California’s housing stock. Even then, SFR construction starts are very unlikely to return to the mortgage-driven numbers seen during the bacchanalia of the Millennium Boom. Before end users can provide sufficient support for the housing recovery, they will need to acquire income — i.e., jobs with wages exceeding the rate of consumer inflation. 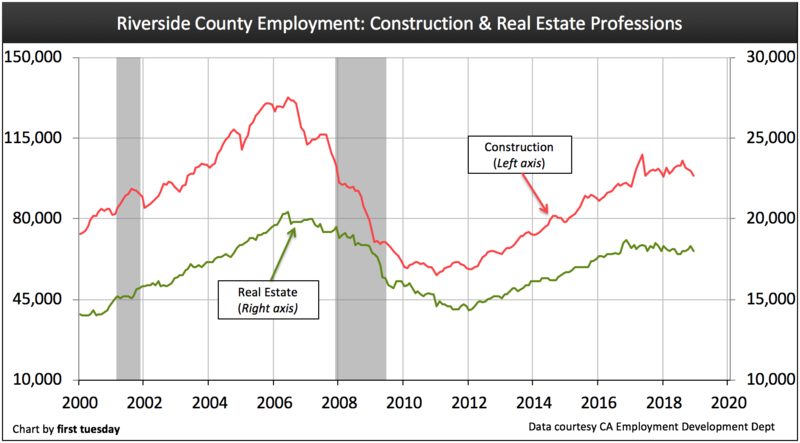 The number of individuals employed in Riverside County finally surpassed its December 2007 peak in Q4 2014. As of December 2018, 228,500 more individuals are employed than at the outset of the recession. However, it will likely take another couple years to build the jobs sufficient to support the population added since 2007 and generate wage inflation needed to adequately support further home price increases. Many of Riverside’s top employing industries have yet to recover from the recession. The number of employed in the construction industry decreased 1.3% this past year in Riverside. Meanwhile, the number of individuals employed in the real estate industry was flat in 2018. The number of real estate and construction professionals employed will see a significant increase when the next confluence of buyers and renters (members of Gen Y and the Boomer generations) enter the market around 2021-2023. 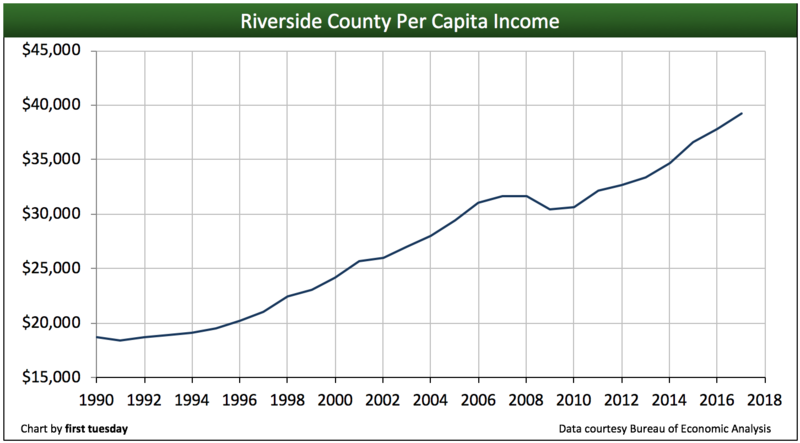 Per capita income in Riverside is one of the lowest in the state. Low per capita income holds down rents and thus new multi-family starts. Annual income rose beyond 2008 peak year amounts in 2013 — and that’s before accounting for the purchasing power reduction brought on by interim inflation. The average employed individual in Riverside earns just $39,300, according to the most recent Census reported year of 2017. The statewide average income is much higher than Riverside’s. 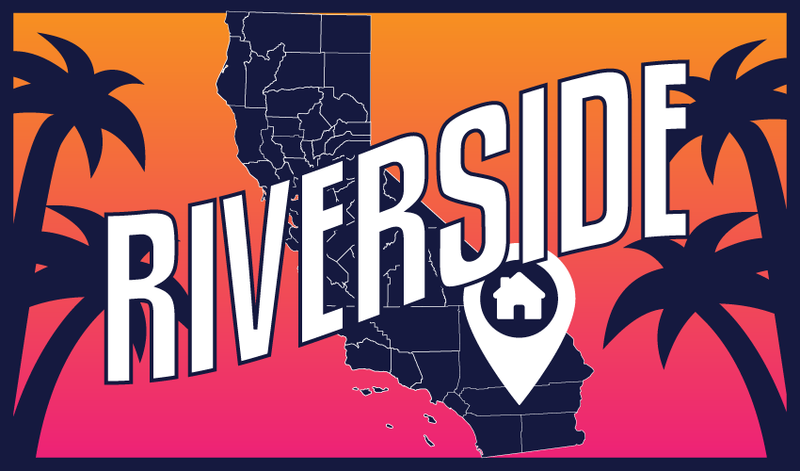 However, the average resident of Riverside spends less of their income on housing expenses than those living in urban coastal cities. Jobs and the pay received by locals is why homebuyer occupants ultimately determine selling prices. Buyers can only pay as much for a home (or rent) as their savings, income and credit score qualify them to pay — nothing more, no matter the price demanded by sellers. Expect per capita income to increase concurrently with increases in job numbers and the competition that brings employer demand for more employees. Maybe I live in a different riverside then the posters above. When I was in college working part time at T-Mobile, I was making close to 50k… Now that I have graduated I work in newport beach which is a 45 minute drive from riverside through till roads …. I had the option to buy a condo in OC for 400k or buy a big house with RV parking for 380k… So guess what I ended up buying in riverside. Most of my co workers are moving into riverside for same reason. That’s why the home prices are going up. Home prices are not made for entry level workers or single individuals…it is fairly easy to make 50 to 60k with few years of experience….combine that with your spouse 60k you can easily afford up to 480k since the interest rates are so low…. So to prospective buyers out there, don’t pay much attention to naysayers …..
What the Author of this article has not included is the TOTAL PICTURE of what is on the HORIZON. For example it was disclosed that California will once again SHUT DOWN OIL in the SANTA BARBARA CHANNEL where currently receive 33% of all of California’s oil, plus the fact that Congress just approved the ability of Oil Companies exporting oil for the first time in FOUR DECADES. That and the mere fact that the current occupant of Sacramento as the Governor,(Jerry Brown), will not change the fact that California charges the most for gas in the U.S. and even though he favors FRACKING for OIL (on his 2,500 acre ranch only) and the fact that California will be increasing minimum wage and the fact that California will be increasing the price of gas next year to $4.50 a gallon for Regular and the fact that Obamacare will be causing the unemployment rate to increase as well and the fact that interest rates will be increasing next year for real estate loans, I do not see how the economy will be improving for at least the next 3 plus years at the earliest. I agree whole heartedly with your assessment. Until income increases, there will be NO real recovery. Furthermore nobody’s addressing the back door property tax increases that are being called ” special assessments ” (an end around to prop 13). 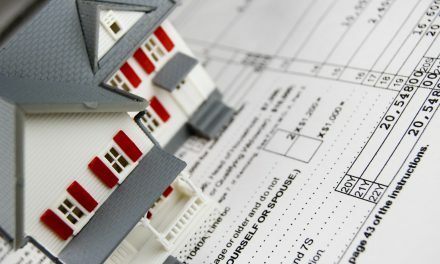 My wife and I have recently been window shopping at all the new construction homes for sale, and noticed that with the property tax and special assessment fees that a buyer could pay in ezcess of 2% in taxes. If you factor in HOA’s your looking at upwards of 1000.00 a month above the mortgage. Then factor in the 50k plus premium the builders are placing on new construction, I’m not sure how a person with an average salary of 36k in this county can afford it. So what I see is lower down payment programs, lower FICO rate qualifications. .. in short we’re opening up ourselves to another bust. Albeit not as large as 05-06, but most definitely sure to happen. The officials in this state have put so much downward pressure on the middle class with high utility costs, fuel costs, “special assessments “… they can’t afford to live here, let alone retire here. The mega rich can endure this , the poor can’t even contribute to the tax base , so you will see a collapse in our local economy. Already I’ve seen a drop in resale prices of 10k-20k just in the past month. The other major factor to consider is job growth and traffic congestion. Jobs being created in the IE for the most part are not high wage jobs. The high wages jobs are primarily in OC, SD & LA and as we all well all know, those commute times have increased substantially in the past few years. To all you Gen Y’ers & Boomers out there, my advice is plan on getting the heck out of this place within the next 10 years. There are much more beautiful and better places to retire then California. Ask yourself what kind of quality of life will you have. Good luck and GOD Bless. The job growth in the IE is due to minimum wage job increase. Why would you need to write an article stating the obvious – that home sale volume is directly tied to job growth, and job growth with real income growth, not minimum wage income. It was the NINJA subprime lenders that created the home boom/bust. The INSTITUIONAL cash buyers like Blackstone, wealthy Arabs and Chinese that were able to buy the distressed properties and REOs and they purchased them in bulk in the IE around 2010 thru 2012, Now they have put them on the market at double (or more) the purchase price. But wage growth is not able to support these listing prices. This is a sellers market for all tiers the problem is the low tier group dont have the wage growth to buy in the IE. The game is rigged I’m afraid….get out of CA as quick as you can! I believe that sam’s comment is clarifying whats really going on in short. And the authors, who spent so much time writing this article, fail to take a moment to speak to his comment; which would help readers. The article says Riverside County per capita income $33,278 per yr. According to Zillow’s qualifying calculator this income would only qualify a buyer for $107,000 house that is with a $20,000 dn payment. And your debt level can only be $250.00 a month. At an annual income of $33,278 divided by 40 hrs a wk x 52=, 1,920 hrs per yr. Equaling $17.34 per hr for one person. Or divided by 2 = $8.66 per hr for two. This looks a little like minimum wage to me. So it would take two minimum wagers to qualify for a $107,000 house. But there are no $107k houses. One can use these numbers and juggle them around anyway they want. You could double the income from $17.34 per hr to $34.68 per hr or $66,556 a yr and you still could only afford a $214,000 house. But houses are ranging around $250,000 house your income would have to be $60,000. It begs the question(s). Who’s buying these houses? Two nurses living together or who. How can these price arranges be? What we have is a squeeze play. Interest rates will have to remain low in order to sell houses that are already to high. There aren’t enough high productivity jobs to support the high price homes. This is a consequence of sending productive jobs to China and Mexico, etc.,and the allowing of illegal aliens/Mexicans and their Babies to do the massive numbers of minimum wage jobs created by corporations, once they found out they could control the government, which allows the illegal aliens into our country. one of the things that has been done is that the money in our country is no longer circulated in our country. To summarize prices are over priced. Who can afford them? Are interest rates set low so that people can have a better chance of buying? Is a crash in the works again. All this said, whats the purpose of this article? The article should be emphasizing that the price of housing way to high. And the next question is who is responsible? Will there be another housing crash? The whole thing is a viscous cycle, whereby China, Mexico, corporations, businesses, illegal aliens, (who make a fortune in our country as compared to Mexico), and other 3rd worlders all make money while true American Citizens are driven down! If I’m wrong please explain why so that I can see the “light”. Your information is helpful. It only, really, raises more important questions, thoughts and ideas as I’ve posed above. Technology is putting people out of jobs not people that want low wage jobs and come here. Just look around you at the tech that can do part or all of what people were doing. The other factor is 80 million boomers that companies feel are paid too much and want them replaced with younger cheaper workers and those same boomers will off load houses as the face retirement and health issues. 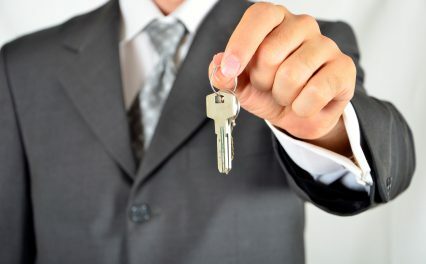 There will be more renters than home buyers. Unfortunately you are right. Technology is replacing some jobs but not the ones being filled by immigrants. Construction, Landscaping, Food Service, Maid Service, just to name a few. Low cost immigrants have been taking these jobs at a pretty good clip for the last 30 years. Not just in California but the entire Southern States and Midwest. Lawn mowing and fast food jobs were primarily filled by young kids willing to work for extra money 30 years ago. Now these jobs are filled by adult immigrants who need money to live. This is why housing prices are outpacing wages. We are filling jobs with people who will work for less than a living wage. The divide between poor and rich is growing as a result. Liberals typically do not understand this dynamic in our economy and that is why it is getting worse. To talk like this will label you a racist or a bigot. Although there is nothing racist about it, Liberals like to use name calling and labeling as a weapon to make their points rather than relying on sound evidence for their arguments or listen to other viewpoints. Their answer is to legislate a “Living Wage” for our minimum wage. It sounds good except that it will increase prices 2 fold, if not more, which will further widen the gap between rich and poor. The problem is simple supply and demand. There are too many low wage and or low skilled workers in the labor force and more on the way. The only benefits are that Corporations profit and increase their bottom line which makes their stocks go up, and Government is adding a new tax base and voter block to vote for and pay for future Government dept. Only in America. Is there a way to separate out retirement communities from the overall residential real estate market? It seems to me that retirees are a market unto themselves and that buying group is growing very fast. I own a property in Heritage Palms.